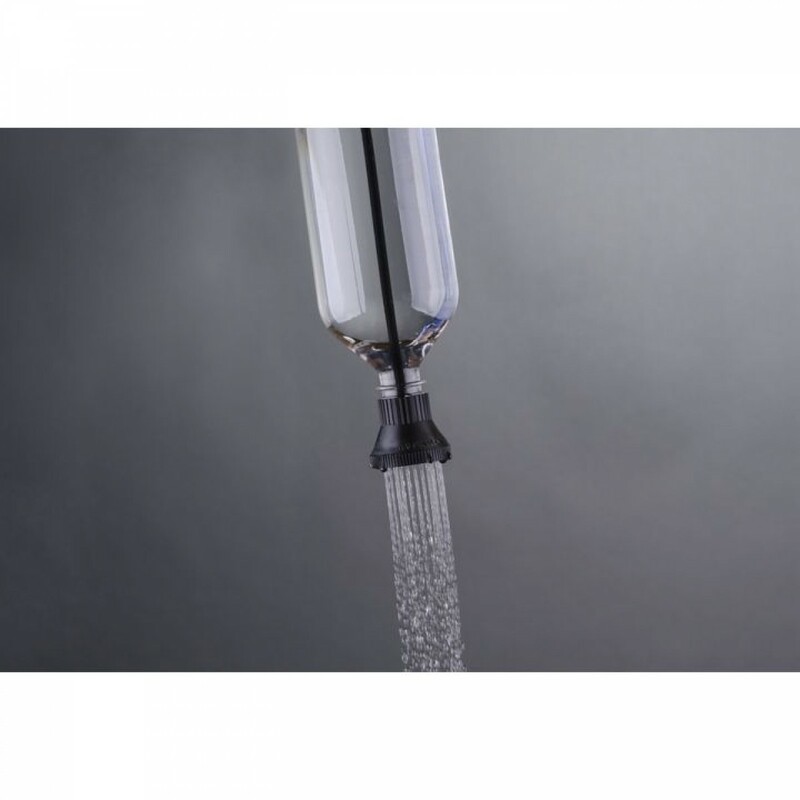 The Simple Shower is a specially designed portable shower that attaches to just about any one or two liter bottle to convert them into a shower. If you’ve ever used a solar shower, you know how awkward they are. Now there’s a real solution – one that you can hold in your hand and has a real shower feel to it when bathing. No more lifting 20 to 40 pounds of water 4 feet above your head to take a dribbling shower. Simply fill a plastic 1 or 2 liter bottle with warm water, or leave the bottle in the sun to heat up, and attach the Simple Shower for a quick and easy shower. Unlike solar showers, the Simple Shower feels like being under a low flow shower. It also fits Platypus collapsible bottles and bladders. 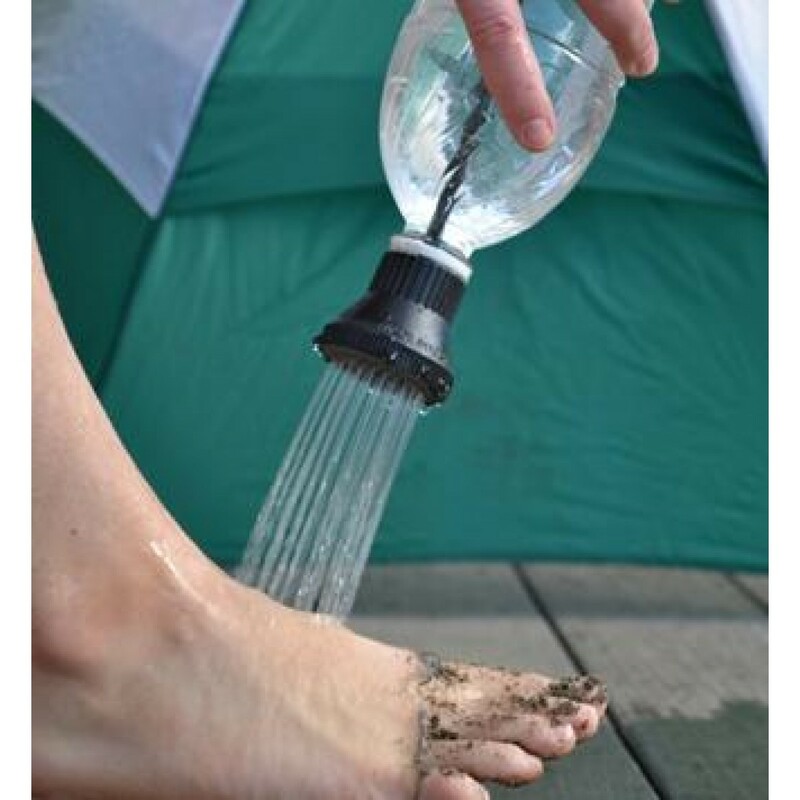 At less than one ounce, it’s ideal for backpacking, canoeing, kayaking, hunting, camping, emergencies, prepping, cleaning pets, washing utensils, at the beach, and anywhere else a steady stream flow shower can be used. Bottle not included. Made in the USA with BPA Free recycled material. What type of bottle can I use? 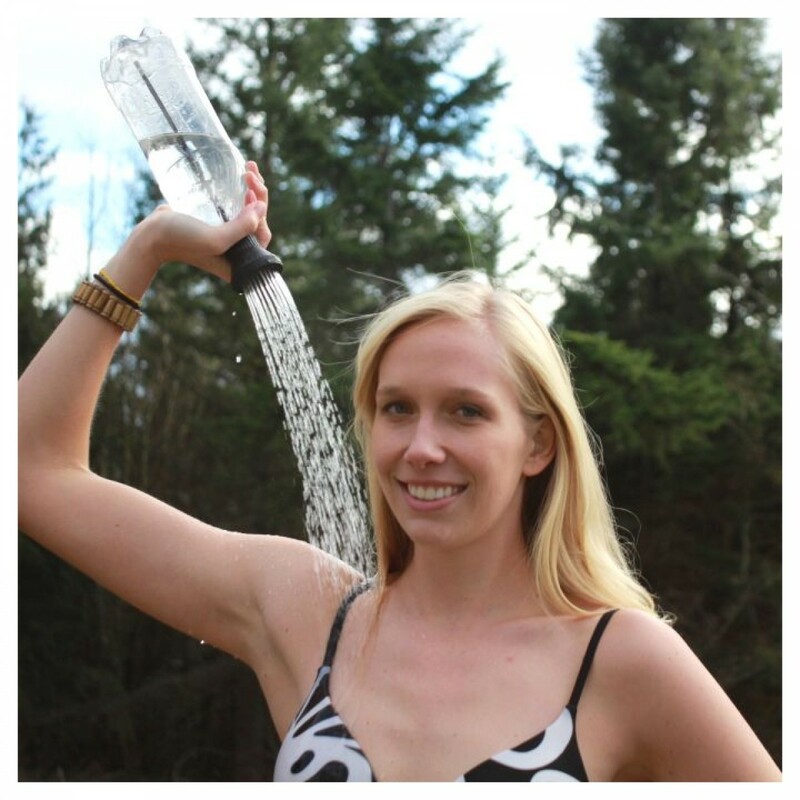 The Simple Shower will fit on practically any 1 or 2 liter plastic bottle. It will also fit on most collapsible bottles, including Platypus, Source, Lifeline, and many others. Rainburst does not provide the bottle. We want you to be like us, thrifty and environmental minded. Use a bottle you have lying around (or ask for a free one from somewhere). Be sure to clean the bottle out prior to use. How do I warm the water up? There are a variety of ways of warming water up. In a test we conducted on a clear day, with beginning ambient temperature of 73F and ending ambient temperature of 82F, we discovered that the ambient temperature of the water in every container was reached within one hour (the original water temperature was 58F). Within 4 hours a one liter bottle had warmed to 104F, a 2 liter bottle had warmed to 100F, and a solar shower had exceeded 120F (beyond the point of scalding!). 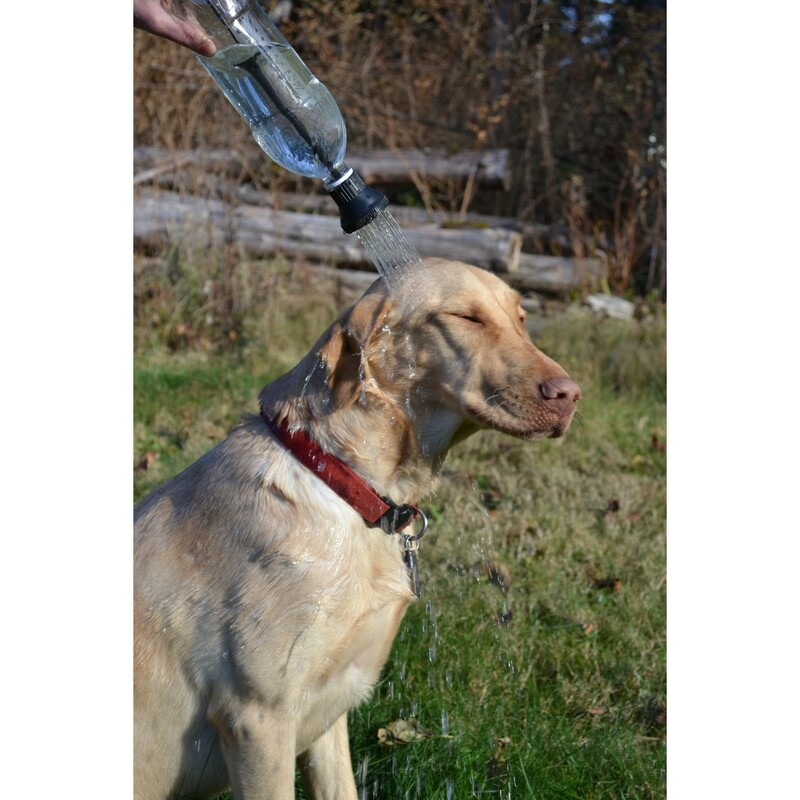 If leaving a bottle out in the sun for four hours is too long, you could always warm some water over a stove and pour it into the bottle (the Simple Shower is designed so you can unscrew the cap and have a funnel). If doing it this way, though, be sure the temperature does not exceed 104F (which is the maximum temperature we recommend using the Simple Shower). Do not put any water into the bottle that exceeds 110F! How much water do I need for a full shower? That depends. Do you like long showers or short ones? We recommend using 4 liters, but 2 liters (a single 2 liter bottle) has worked. Simply wet your body, lather up, then rinse off. Not quite as good as a long, hot, steaming shower in your own home, but it’ll definitely do the job.